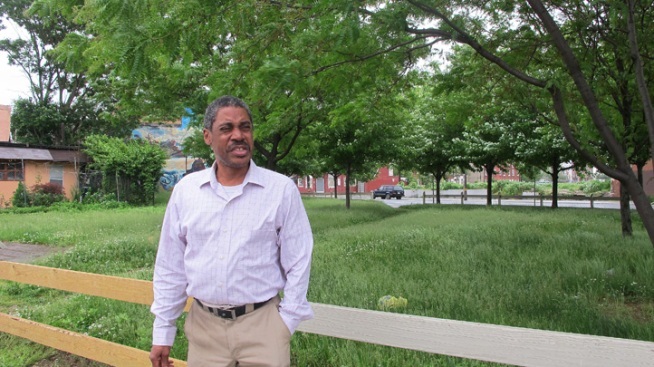 This 2013 file photo shows Earl Richardson standing near his neighborhood pocket park in Philadelphia. A study published Friday, July 20, 2018, found that such parks helped improve the mental health of residents. People feel happier and less depressed when vacant lots in their neighborhood are cleared of trash or "greened up," according to what might be a first-of-a-kind study of public space's effects on mental health. NBC News reported that Philadelphia residents who lived near vacant lots that were filled in with trees and grass or simply cleaned up reported to University of Pennsylvania researchers a decrease in feelings of depression, poor mental health and feelings of worthlessness and hopelessness. Renee Holly, a 54-year-old custodian, is in charge of keeping her greened-up North Philadelphia lot in good condition after the Pennsylvania Horticultural Society cleaned it up. "It's a beautiful thing to have a clean lot, it makes me happy," she said. "Now, our neighborhood kids don't have to play in a lot with glass and trash."